New England's austere people are portrayed with grace and humor by the Border Limner, Ammi Phillips. Ammi Phillips began his professional career around 1811. He travelled extensively in the New York - Massachusetts - Connecticut border area, and because of this, became known as "Border Limner". He married Laura Brockway in 1813 and the couple moved to Troy, New York. At some point they moved to Rhinebeck where his wife died in 1830. He remarried shortly after. Around 1829, he started painting in a new style. The works from this period were from his "Kent Period", named thus because that was the town in Connecticut where the paintings first surfaced. He probaly did the paintings in New York's Duchess Conty. I was delighted to learn about him from his elegant pink and neutral portrait of a young girl, "Harriet Leavens", we saw yesterday at Williams College's Clark Museum. Albeit, Mr. Phillips was born well over 80 years after the English writer, Jane Austen wrote her celebrated books, the spirit, the simplicity and the styling really reaches over that span of time to embrace her thinking, the styling and the imagery that in my imagination, I sew to her words. However, Ammi Phillips is lumped into the folk art category (which I go to interpret as decorative illustration and decorative portraiture) and is in a way pooh poohed as its just a whisker away from primitives (read heaven..the work of the amazing Edward Hicks surfaces immediately). I am particularly fond of Limner paintings (those portraits done by itinerant painters) as I grew up eating in my grandmother's dining room with two family limner paintings (Henry and Margaret Gibbs(1670) framing the door to the kitchen. Brother and sister paintings were two out of the three (a brother was in the Boston Museum of Fine Arts) and had been in the family the entire time somehow ending up in my grandmother's house in Charleston, West Virginia. These portraits, done by the Freake Limner, had been in my family until my grandmother's time. Upon my grandmother's death, Margaret was bequeathed to join her brother, Robert already at the MFA in Boston. Henry was given to the Clay Center in Charleston WV. I am descended from Margaret, who was married to Nathaniel Appleton of Salem MA, a merchant. 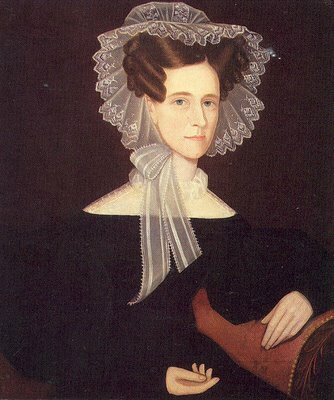 Margaret Appleton and her husband were painted by Copley. 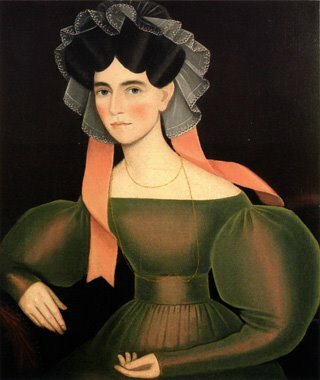 Margaret's portrait was given to Harvard University in 1855. Her husband, Nathaniel's portrait is still in the family--a shame they are not together as they are a wonderful pairing. I am a bit puzzled by the dates they cite for Margaret's birth/ death as her limner painting was well over 20 years prior to the stated birth unless this is the next generation (which is possible). The paintings by Phillips sets my mind to whirring over Austen's writing, while the Freake-Gibbs Limner calls the Scarlet Letter to mind...and of course, my beloved early american tombstones. I love how it all tails one into the other. The collection of American paintings, over 1600 works, is considered by many to be among the best in the nation. 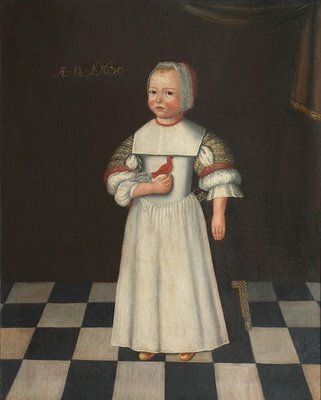 The earliest paintings are anonymous portraits of Robert Gibbs and of Margaret Gibbs, both painted in Boston about 1670. Executed not long after Boston was settled, Margaret Gibbs is one of the finest of the few extant portraits painted by New England artists in the seventeenth century. 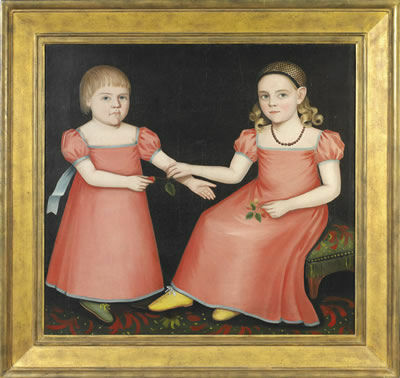 The artist, who also painted portraits of Margaret's brothers-Robert, age four-and-a-half (MFA, 69.1227) and Henry, age one-and-a-half (Sunrise Museum, Charleston, West Virginia)-is unknown. However, it is thought that he created the likenesses of John Freake and Elizabeth Freake and their baby Mary (Worcester Art Museum) in 1674. He is thus known as the Freake-Gibbs painter and is considered one of the most skilled portraitists of the seventeenth-century colonies, possessing an exceptional sense of design and an admirable feeling for color. Probably trained in provincial England, he painted in a flat style derived from Elizabethan art that emphasized color and pattern. Margaret Gibbs was the oldest child of Robert Gibbs, an English gentleman who had emigrated from England to Boston in 1658. Robert married Elizabeth Sheafe of Cambridge, Massachusetts, in 1660, and in the same year Elizabeth inherited considerable property from her grandfather. 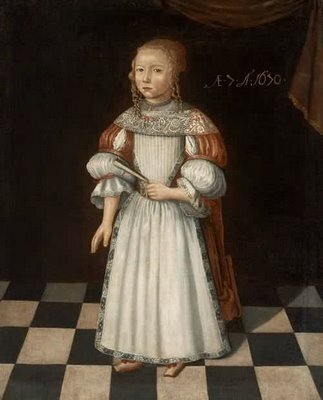 A successful merchant, Robert had their three children's portraits painted in 1670. The depictions of Margaret and her brothers in all their finery are evidence of the materialism and prosperity of the Gibbs family and the remarkable growth of the city of Boston. 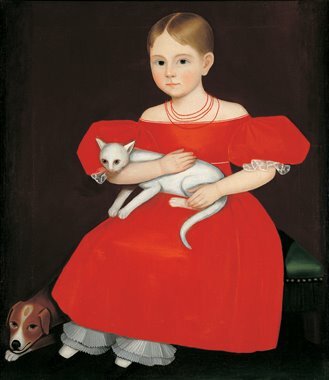 In this portrayal of Margaret, the Freake-Gibbs painter has meticulously rendered the seven-year-old's lace, needlework, silver necklace, and red drawstrings and bows. Her sleeves have the single slash allowed by Puritan sumptuary laws. Such finery was only permitted by Massachusetts law if the man of the house possessed either a liberal education or sufficient annual income. Margaret's fan is an indicator of her gender, as children of both sexes were dressed similarly until the age of seven or eight and an attribute was needed to differentiate between images of boys and girls. The pattern on the floor is either black and white tile or, more likely, a wooden floor painted to simulate tiling. This pattern, the dark neutral background, and the inscription of the year and age of the sitter are indications of seventeenth-century Dutch influence on English and subsequently on American art. The period frame of the picture is made from American pine painted black, thus making it probable that it was crafted in New England. This text was adapted from Davis, et al., MFA Highlights: American Painting (Boston, 2003) available at www.mfashop.com/mfa-publications.html.